American Airlines has apologised to two professional basketball players who were kicked off a flight after being wrongly accused of theft. Marquis Teague and Trahson Burrell boarded a plane on Christmas Eve, en route to a game. But before take off, a flight attendant claimed the men had taken blankets from the first class cabin, and they were forced off the plane. It later emerged the pair had been given the blankets by passengers. Both of the basketball players are African American, as was the flight attendant involved. Neither of the athletes, who play for the National Basketball Association's minor league team Memphis Hustle, has commented on the incident. But Hustle assistant coach Darnell Lazere tweeted that he believed the incident was driven by race. The players were flying from Dallas-Fort Worth International Airport to Sioux Falls, South Dakota on a flight operated by Envoy Air, a subsidiary of American Airlines. American Airlines spokesman Joshua Freed said the carrier was now reviewing the incident. Image caption Marquis Teague (left) and Trahson Burrell (right) have yet to comment. "We apologise for what occurred on this flight. 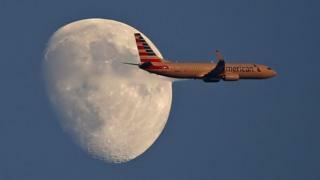 We take pride in bringing people together, and we know that on this flight we let some of our customers down," he said. Mr Teague and Mr Burrell were given first class tickets and flown to their final destination on a later flight. Their team won the Christmas Day game against Sioux Falls Skyforce 131-115, with Burrell scoring 15 points and Teague getting 11. American Airlines has been trying to address accusations of bias in the way it has treated some customers. In October, the civil rights group NAACP warned of "a pattern of disturbing incidents reported by African-American passengers, specific to American Airlines". The carrier later pledged to put its 120,000 employees through new training.